Save the date! The next Rouge Valley Quilters' Guild quilt show has been confirmed for Saturday April 5 and Sunday April 6, 2014. This will be two weeks after March Break, and two weeks before Easter. 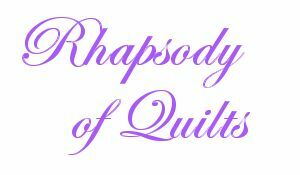 Joanne won the contest to name the show with her great title, "Rhapsody of Quilts." Congratulations, Joanne! Our show will be at a new location this year, the Pickering Recreation Complex at 1867 Valley Farm Road in Pickering, Ontario. This will give us a larger, fully accessible space with room for more vendors and plenty of quilts! The Quilt Show Committee is busy firming up all the details, and the raffle quilt is pieced and about to be quilted. So, what can you do? Finish your quilts, UFOs (unfinished objects) or PhD's (projects half done), and get them ready for the show. Prepare to be involved, we will need volunteers for various tasks during the Quilt Show. For those who are in quilting production or have items for sale, the Guild Boutique will be back. We will also be seeking donations of your best quilted items for the Penny Sales, and cookies and pastries for the Bake Sale. Plan to put your creativity to task with the Quilt Challenge! Details to come. And, don't forget to inform your family and friends of next year's event! We're looking forward to a fun show. See you, and your quilts, there!